advice on saving, money, and school. Apply for your next loan or account online! Community Financial’s eServices are designed to give you account access from home, work, or out of town, you can view account details with eBanking & Mobile Banking, plus pay bills through ePay. You can also go green when you set up eStatements, eReciepts, eNotifcations and eAlerts! Our ePay has a new fresh look! Want to learn more? Check out our ePay tutorial videos here. Beginning September 20, 2017, you will need to use one of the following browser versions (or higher) when using our bill pay services: Internet Explorer 11, Edge (any version), Chrome 42, Firefox 31, or Safari 9. Community Financial’s ePay service makes it easy to pay all your bills online from your Community Financial checking account. 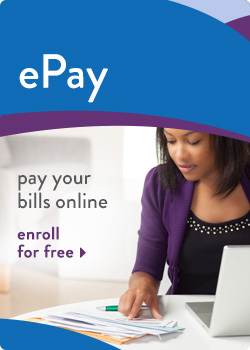 Enroll by clicking on the ePay Tab in eBanking and establish your new ePay security settings. Then build your list of payees and manage your bills online or using our Mobile Banking Apps. Receive customized email notices alerting when a payment is due or deducted from your checking account. If you have specific bill pay questions click here to check out ePay Frequently Asked Questions or contact us at (877) 937-2328. Once ePay is established, you can call our toll free, ePay support line at (855) 397-4254 if you have questions on your transactions. Additional coverage provided by ESI. Thank you for your interest in a loan or deposit account at Community Financial Credit Union. Please review Community Financial's field of membership in the state of Michigan and choose an option below. • I am currently a member or believe I qualify for membership based on Community Financial's requirements. • I do not meet Community Financial's field of membership requirements.